Please read: This is a community-maintained wiki post containing the most important information from this thread. You may edit the Wiki once you have been a member for 90 days and have made 90 posts. that's one hell of a teaser!!! we already have "BoB" - let' call this "the egg"
it also looks like the end of e-clips? could those wheels be slightly oversized ala Losi? According to Kyosho France its first official appearance will not be in Shizuaoka Japan but at the 10th Kyosho Masters just outside Paris. By the looks of it have they abondoned the blue aluminum? Nice to see those big bores from the mp777. The 8GG!!! I don't see how there could be mud gaurds under that shell. Look ho narrow it is!! Now I really wanna see whats under there. I see hexes! Maybe they finally listened. No signs of green anidizing though. Shame, that would have been sweet. a few things I notice are the larger shock mounting pins, new c-hubs,wing mount, screws holding the hing pins, new front and rear arms> If everything out of the shell is new i wonder what kind of goodies they are hiding underneath the egg. Don't mind it being called the egg......as long as I don't have to wait till Easter till I can get it! That body is way too narrow for any components to fit under there. I wouldnt' be surprised if they used a new chassis, cut 1" off either side and just fit the egg body over it. 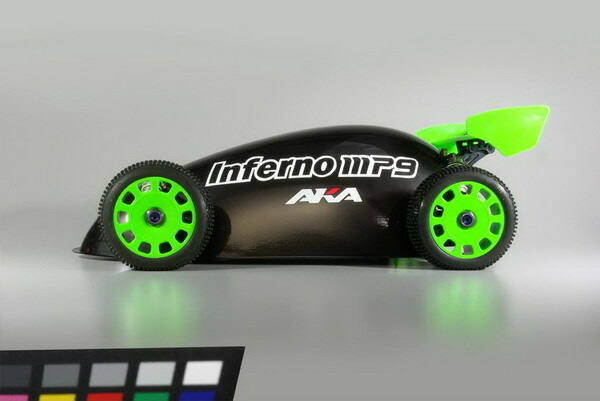 BUT, if all of the chassis components are under that egg body, it'll be a Losi clone guaranteed. After all, the Losi has been the most popular buggy of all time. You have to hand it to Losi, they had some way ahead of the curve innovations on the 8ight and others are following suit (Xray, HB). Kyosho almost singlehandedly carried the 1/8th class in terms of quality and performance standards (not to mention being the most copied design of all time) so if they borrowed an idea here or there I think we could forgive them. I'm sure it's going to be a top performer. Hopefully they will choose to compete price wise too. K cars and parts have always been on the pricey side. That's a very bold statement to indicate the legendary inferno that almost all buggies are cloned after is trying to clone an 8scale buggy newcomer. A similar statement would be Mercedes-benz is trying to clone Pontiacs..why? just looking at the suspension and the Chub design there is no way anyone can compare this to a Losi. Even if the engine was close to the centerline like the losi... the main points of the losi are not on this car. All times are GMT -7. It is currently 03:25 AM.